21 Bundles is a monthly subscription box for moms-to-be and new moms. It focuses on chemical free goodies to take you from bump to baby… for a healthy motherhood. 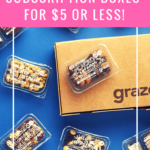 This review is of the monthly $39.99 subscription box. This box is catered towards my due date of 11/11/17. Input yours upon ordering so that each box is customized to where you stand in your pregnancy. The Cost: $39.99 a month + $3 US shipping. International shipping varies by location. Save with 3 and 6 month pre-pay plans. COUPON: Use code BABY20 to save 20% on your first box! The Products: Chemical-free, organic beauty, health, house, and baby items for moms tailored to the specific month of her pregnancy or new baby’s life. Check out all of our 21 Bundles reviews and more pregnancy subscription boxes in the Mom’s Subscription Box Directory! Each box comes with an information card that offers some advice for the season. It also directs to 21 Bundles‘s sister shop, Healthiest and a coupon to save 20% off summertime essentials, including items that you’ll find in your monthly boxes. This box also came with an ‘eight months’ sticker so that I can show off how far along I am! I was super pleased to see tea in this month’s box! At almost 30 weeks, I’m not feeling like doing much else but lay on the couch in my comfiest clothes with a hot beverage. This blend had a subtle minty flavor — not too strong, and very easy to sip. Its mix of red raspberry leaf, stinging nettle, chamomile, and oatstraw addresses third trimester issues like inflammation and soreness so that you feel prepared for labor. This salt soak smells divine. I was looking forward to trying it after a long day on my feet since I’ve noticed an increase in swelling recently, but, I didn’t notice a huge improvement. Granted, the salt offered a really lovely experience in its lavender-y-rose-citrus dream of a scent! Maybe using this consistently paired with a half hour or so of elevation and some massage would yield some positive results when it comes to extra pregnancy-related fluid retention. The floral bits are also quite large, so I’d advise using a drain protector if you use this soak in your tub. I’m a bit ashamed to admit that I’ve never used an organic toothpaste prior to receiving this product. I was impressed! The flavor was a strong sort of medicinal mint compared to the sweeter mint mainstream toothpaste brands that I’m used to, but I liked that. This toothpaste left my teeth undeniably clean, and I felt good knowing that the product is all natural. Another really effective oral care product. This mouthwash was refreshing and minty. In addition to the original formula that I received, Oral Essentials also offers whitening, sensitivity, and dry mouth products. It’s also awesome that it comes in a travel size. I plan on keeping the bottle once I’m done with this mouthwash so that I can refill and pack the container in a carry-on for my next flight. I love that this moisturizer is all natural and vegan! Its consistency is a bit thicker than what I’m used to for a daytime product, so I find myself using it quite sparingly. It does leave a bit of a residue, so I’ll wipe away excess with a toner-soaked cotton pad before applying makeup (if it’s a makeup day — those are rare lately, to be honest). Its scent is a pleasant citrus that really IS revitalizing in the morning. I was just remarking to my husband before a recent hike that I wasn’t comfortable with using our usual bug spray now that I’m pregnant. This organic formula couldn’t have arrived at a better time. Making sure that you have a pregnancy safe bug spray seems to be one of those things that aren’t a priority until it’s too late (at least in my case), so I’m impressed that 21 Bundles is covering all the bases. This lotion does have a pungent scent that’s not unlike other repellents that I’ve used, but this one is definitely less obtrusive. It’s kind of like an extra strong citrus scent…? And it totally did its job on my long walk through the park this past weekend. No bites! I was a bit surprised with the consistency of this product. It has a bit of slip to it, much like a massage oil. The aloe, grapefruit, cypress, and peppermint blend is zesty, aromatic, and made me instantly feel like I was in a spa — especially when paired with the salt soak above. Being that foot swelling and general leg discomfort is a new issue for me, this product is a box fave! I’ve tried a handful of belly oils now that I’m a subscriber to several maternity boxes, and this one is really nice. First of all, the herbal scent is great. I also love its natural ingredients: marshmallow root, rose hips, lavender, chamomile, calendula, apricot oil, and lavender essential oil. My only complaint is that I wish it absorbed into the skin a bit better. Verdict: My second 21 Bundles was really wonderful! I love that their products focus on you throughout your pregnancy journey. Don’t get me wrong, receiving baby essentials is fantastic, but 21 Bundles takes a different approach to other maternity boxes and offers self-care items to nurture your mind and body. It’s something that moms-to-be often forget to do in the stress of preparing for baby, and I appreciate the reminder to make time to really care for myself. With a calculated value of $63.95, the $43.00 cost of this box is so worth it. This box would also make a thoughtful gift for the expectant mom in your life. What do you think about 21 Bundles? How do subscribers rate 21 Bundles? Do you subscribe to 21 Bundles? Add your rating now!